Judith and I received a super wedding gift. 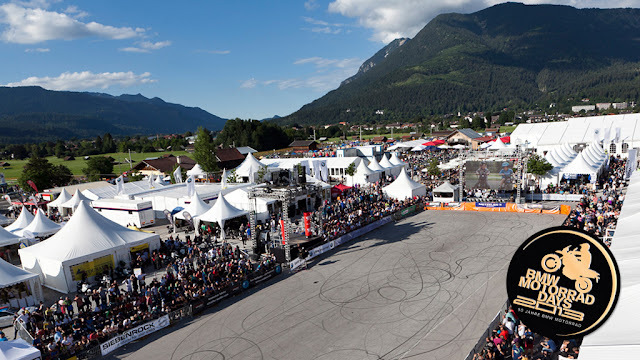 We were fortunate enough to spend the weekend in Garmisch-Partenkirchen (GAP) at BMW Motorrad Days. This was all thanks to some secret organizing by our friends Christian and Wieland, and donations from other friends (a Big Thank You from Judith and Me!). Motorrad Days was held July 5, 6 and 7. Here's a link to a video that will give you an idea of the event. BMW Motorrad Days 2013. The video gives a nice overview of the event, but it doesn't (and probably cannot) come close to the real thing. I took about 400 pictures on this trip, but edited them down to about 130. You can see them here: Pictures - BMW Motorrad Days Tour. Hope you enjoy them. Christian, Yella (Christian's daughter), Steffi and Wieland also joined us. A hotel (the Dorint Sportshotel) was pre-arranged by Christian. The Dorint is a very nice 4 Star hotel not far from the Garmisch-Partenkirchen Ski Area. The venue at the Garmisch-Partenkirchen Ski Area is expansive. Over the weekend there about 30,000 visitors, and it seemed nearly as many motorcycles. The facility really does a super job in staging the event. BMW Motorrad must have a monstrous budget for the event. The number of demo bikes for both Street and Enduro riding was huge. Every model was available - from the new C 650 Scooter up to the K 1600 GT and GTL. The street demo rides were 90 minutes and went over some great Straße. On Fri. they included the B11 over Kochelsee Pass, a very nice twisty ride. The road is closed to motorcycles on the weekend, but we road in over the pass on Friday morning. An Enduro track was carved out on the event's grounds on which you could ride any of the BMW GS models for three laps per session for free, for as many sessions as you wanted or were able to do (OK, there was a 5€ charge for a Riders Pass that covered all demo rides). The crowd on Friday was very large, but on Sat. it was gigantic. We watched the mob riding in for awhile and were sort of slack-jawed at the number and diversity of bikes. The Polizei did a great job keeping things moving and organized (of course it is Germany, it is expected). Many, many, many interesting BMWs, including R90s and R80GSs, plus a good number of real "Oldtimers" both ridden in and on display. There was a large pavilion for the various BMW Clubs throughout Europe with museum quality examples of BMW Motorrad, including, but not limited to, an R32, R7 Prototype and display of the evolution of the GS. Chris Pfeiffer as usual put on a mind blowing exhibition Chris Pfeiffer BMW Motorrad Days 2013. The Original Motodrom (Wall of Death) was also as entertaining as can be. Great Bier and Brots were in good supply as well, and at reasonable cost. We were witness to one unfortunate event however. It was scene from the 60's Beach Party movies ( you know, Frankie Avalon, Annette Funicello and Eric von Zipper). There was a long row of bikes (mostly BMWs) parked side by side and pretty close together. They were on a very slight downhill slope, some resting on side stands and some on center stands. Some dude comes along and parks his bike at the high end of the row of bikes - puts his side stand down - gets off the the bike and starts to take off his gear. The bike falls to the right, hits the next bike, it falls and like dominos about a dozen bikes go down. Judith and I saw the entire thing unfold in front of us in slow motion. And yes, there was some relatively serious damage to a few bikes. A bunch of people all pitched in (including me) to untangle the mess and get everything back on two wheels. Except for the guy who started the avalanche, it didn't look like any of the bike owners were around, so there will be some big (WTF) surprises, but no one was hurt. To my amazement, all of this, except for Bier, Brots and 5€ cost for a demo Riders Pass, is at no cost. This a good one for the Bucket List. Digger, seems you've settled into life in Deutschland very nicely and are enjoying all there is too offer. "Please turn right at the next intersection..."